What I liked about crocheting this blanket is that it was pretty easy and I changed my blanket a little from Darlene's blanket. The dimensions of the blanket are 32'' wide by 42'' length. Once all the granny squares were made I laid them out the way I wanted them to look. I then single crocheted all the granny squares together. 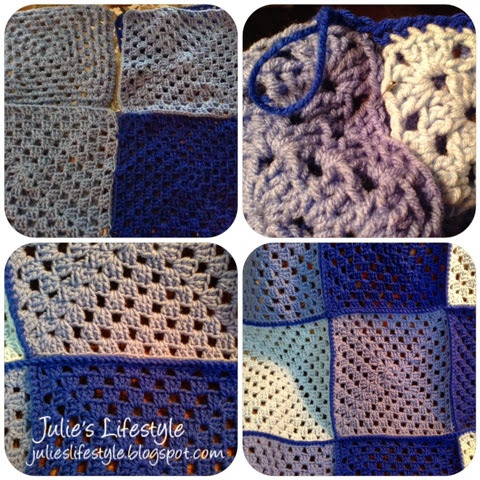 The granny squares are each a solid blue color yarn. To see the tutorial I used for assembling all the squares you can find it HERE from Sarah at Repeat Crafter Me. Darlene had single crocheted around each square but I did not do that when I made my squares. For making the border I will single crochet all around the blanket. When I have the border finished I will take a photo of the finished blanket to show you. I hope I have inspired you to create a granny square blanket too. This blanket I made is being donated to the crochet group that I belong to at my church for the Christmas Fair in the fall. That's a beautiful one. Love the colours! It looks lovely, I am pondering over a knitted patchwork blanket in similar colours but I do like the look of your crochet one. And you can never have too many blankets. Julie, your blanket looks so good and you really did a wonderful job. So pretty Julie. I am still working on my mom's Christmas blanket- Ha! I am knitting it...once I finish that (in time for next Christmas maybe!) I really want to learn to crochet! I really like the colours you're using in your blanket, Julie. It's so pretty! I wish I could crochet. I've been knitting since I was a girl but have never really learned how to crochet. Can I come to your house for some lessons? LOL! Oh Julie, your lovely hands have created such beauty! This blanket is gorgeous and the colors you chose are perfect :) Hugs to you, my friend! Julie it's wonderful! Don't you just love those easy projects that don't require much thinking. They're my favorite type. You've done a great job. Can't wait to see the edging when you're all done. Julie, your blanket looks beautiful! the colours you have chosen blend together so well. the blue , the lilac, the gray. Would love to see a full size pic of the blanket. Beautiful colour combination its looking delightful. I swear, one of these days I will learn to crochet! Pretty! Great job Julie! I usually stick to small projects because I get bored but an afghan is on my to do list this summer! Granny square blankets are my favorite, and this one is a beauty!! My favourite type of blanket - the one with grannies! Yours is beautiful Julie! Stopping over from the Worthwhile Wednesday Hop. Your afghan looks great! I like to crochet the squares together, too. I used to try and sew them with a needle, but this goes faster and holds up better. Nicely done! Thanks for sharing this lovely pattern. The colours you've chosen are wonderful. Such a beautiful blanket :) Gotta love granny squares! Love the blanket - beautiful colours. Julie, you did a great job! I love the soft colors. It's beautiful. Your blanket looks fabulous Julie! Love Crocheted blankets are the best... so cozy. Hi Julie, this blanket is so gorgeous! I love those colors combinations! Great blanket - I like the colors. Hi Julie! Marilyn from the Merry Monday blog hop! Congratulations! I wanted to let you know I chose your blanket as my Featured Pick. I really love it. Come by and grab your feature button. I hope you enter again this week! Oh, I just adore the colors you've chosen. I keep thinking about making a square quilt with the extra yarn I have. Yours is so pretty! Thanks for linking up at Creative Spark! 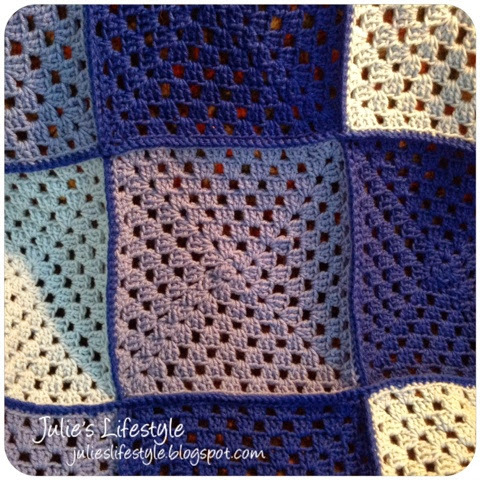 Gorgeous blanket Julie! Love the colors. Thanks for sharing it with SYC. Granny squares would make such a wonderful summer crochet project... when you don't want to be trapped under a blanket all summer! What a lovely pattern. I like how big your granny squares are. Lots of fun! Thanks for linking up to Snickerdoodle Sunday!